How good is TCPS2, Canada's current framework of research regulation? Martin Tolich, with co-authors, thinks it's pretty good. 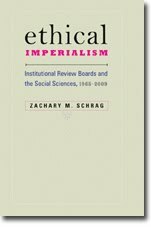 He suggests that at the very least, it can serve as a starting point for other countries interested in reforming their systems of research ethics oversight to make them more responsive to the concerns of social scientists and the people they study. it embraces academic freedom as a value, even as U.S. researchers do not. Tolich and Barry Poata Smith of New Zealand see TCPS2's chapter 9, on research with indigenous peoples, as superior to existing structures in New Zealand and advocate for "a variation on the Canadian model" to avoid "paralysis" of research. In a separate article, Tolich and Will van den Hoonaard report on the 2012 Ethics Summit (which I attended) and note that "Chapter Ten of the TCPS 2 [on qualitative research] did not become the subject of much discussion despite the international acclaim it had received." They offer the excuse that "it was essential that delegates to this first summit establish the problem (and solution) on their own terms, rather than one 'made in Canada,'" but a greater problem may have been the lack of information about how TCPS2 was working in practice less than two years since its promulgation. As TCPS2 matures, I would like to see more Canadian researchers' descriptions of work under the new regime. Is TCPS2 as good in practice as it looks on paper?